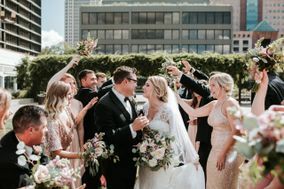 We chose the Rivue because of the beautiful venue and the view it offered with the convenience of having a hotel attached. In the year we had a contract with the Galt House we had three coordinators which was frustrating and unassuring. Our first coordinator Courtney was amazing, our second coordinator was stressful, and our third coordinator Brooke was amazing! I lived out of town and it became exhausting constantly scheduling time towards reexplaining my vision, going over what had previously been promised and hoping the same would hold true with the next person. The first tasting was a terrible experience as it tasted like my family and I were eating cold day old food and it was not what we had picked out (this occurred during the time of our second coordinator). I was unable to attend the "redo" as I lived out of town but my family said it was a 5 star tasting and that they didn't want to leave (this occurred when our third coordinator was in charge). After we got through the many months of frustration due to administration change everything came together because of one person, Brooke.. Brooke Valentine did an absolutely incredible job taking over and went 100% above and beyond to make sure our wedding was perfect and stress free. She had a lot to of questions to answer that previous administration did not get around to and she did it all in a timely fashion. She was extremely easy to talk to, very understanding and accommodating. She rein-stilled the confidence and trust that every bride needs in a coordinator. I am so thankful she took over and I will always recommend the Galt House as a wedding venue as long as Brooke is in charge! The Galt House is my reception location and I cannot wait! The ballroom is spectacular and Courtney/Amber are great to work with. They respond to e-mails in a timely manner and are willing to help accomodate whatever I need to make my dream come true! They are also willing to help keep my budget in line-We are staying there the night of and the bride and groom and parents of the bride get a free room! I just recently had my wedding reception at the Galt House and overall we are VERY satisfied with how everything went. It truly was our perfect wedding and reception. We chose to use the Archibald Cochran ballroom. The food was fabulous, the servers and bartenders were great to work with, efficient, gracious and never in the way. The main woman in charge of service consistently checked in with my mom to make sure things were going well and made her plates of food. They also updated her on the bar status and when our alcohol budget was running low. The room was absolutely beautiful once decorated and I greatly appreciate how much they set up for us. On my big day I wasn't scrambling to place menus in napkins :) and I love that I didn't have to worry. They really took care of everything. The only real "issues" I have, is that I feel there were missed opportunities to really wow us. Our honeymoon suite was a standard room with no special touches. No flowers, no note of best wishes, no vase for my bridal bouquet, and no champagne. A welcome kit or any of those items would have been very special. I had thought a box of our food would be awaiting us when we arrived in the room, but that wasn't provided and we were starved! They also at times seem to nickel-and-dime you. Only lap length white tablecloths are provided free, which is not appropriate for a formal event. I hate seeing table legs! And only certain colors of napkins provided. Just not a lot of wiggle room. Also would charge to pass out the cake and to provide guests with their welcome bags at check-in. Some things I just feel should be provided with such an expensive reception and lots of hotel rooms for guests booked. I would however use them again in a heartbeat. I have had friends and family tell us it was the best food they have had, the most beautiful and really the best wedding they have ever attended. Exactly what a bride wants to hear! The Galt House as an overall package venue was good. It was the coordinator that we had to deal with that took down the rating. The coordinator would argue with us (bride and groom) about what we wanted and we were willing to do. We had to constantly remind her of what we wanted despite her "writing them down". In the end, it all worked out and most of the staff was very friendly and helpful. But, getting to that point was a headach and almost made us change our minds dispite what would have been a huge monitary loss. Our advise, if you go with the Galt House make sure you keep a good record of ALL conversations and are comfortable with the person you have to work with. P.S. The food was fantastic! The Galt House was beautiful and wonderful. When we booked it back in Feb Kristy Brown was working, a wedding angle sent from the wedding gods. Everything was "yes", "sure", "you don't want to do that because... but I would suggest." Kristy left in early summer and the Galt House never recovered. The new planner was thrown into pool quickly and never swam to the top. But all in all, the Reception was incredible, our 200 guests talked non stop about how good the food. If you choose the Galt you will never regret.